Free Schools are state-funded schools which operate independently of the Local Authority. They have the same legal status as academies. Free schools can only be set up and run on a not-for-profit basis by charitable trusts, such as a multi-academy trust. Why is Endeavour MAT proposing to open a secondary free school in Dartford? Estimates of the number of pupils at secondary level across the area show that new schools are required to meet the basic need. Kent County Council have recognised this need is very pressing in the Dartford area and working with the DfE invited Trusts to apply to open a new school at the Stone Lodge site to meet that need. Endeavour MAT was delighted to be the Trust selected to open this school. The Trust already runs two heavily oversubscribed Grammar Schools in Wilmington and is pleased to be able to offer this expertise to the non-selective sector. How many pupils will the school have and what age group will it cover? It is anticipated that it will open with four forms of entry (i.e. 120 pupil places) beginning with 11 year olds (Year 7). However, as it becomes established it will provide for 180 pupils in each year for 11 to 16 year olds and will offer a sixth form. We are opening in September 2019 in temporary accommodation. The opening date for the newly built permanent site will be September 2020. How can I apply for my child to join the school? What will the curriculum be like? The school will deliver a balanced academic curriculum with an emphasis on STEM subject and enterprise skills. The school will work closely with industry partners to ensure our subject offer ties in with the demands of key employers. The curriculum will be tailored to reflect the characteristics of the students who are expected to attend and will contain opportunities to specialise in Engineering and in Public Service. How will the school ensure high standards of behaviour and personal development amongst the pupils? All Endeavour MAT schools have a strong emphasis on personal conduct and self-reliance. The Schools within the Trust have their own identities but share the common values of respect, integrity, community spirit and a mind-set of entrepreneurship, innovation and resilience. This creates an atmosphere where students can explore their strengths and develop their passions. How will I be able to keep up to date with news regarding the opening of Stone Lodge School? How will the school be held to account? The school will be run by a Headteacher, supported by a leadership team and managed by the Trust’s CEO. 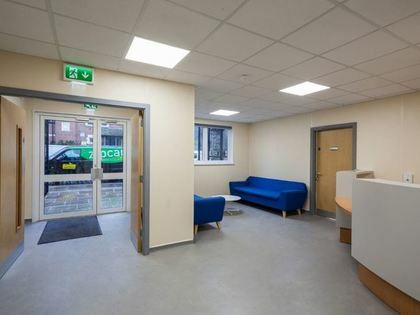 This will ensure that the characteristics of the Wilmington Grammar Schools which are popular with parents and pupils are reproduced in Stone Lodge School. In the first year of opening Stone Lodge School will be directly overseen by Endeavour MAT Board of Trustees. Thereafter it will have its own Local Governing Body to both challenge and support the senior staff within the school. Before the school is given final approval to open, it will need to go through a readiness to open process with the DfE. This will include inspection by Ofsted. Once operational, as with all schools, it will be subject to the normal Ofsted inspection process. Where is the site for Stone Lodge School? What will the 2019 temporary site look like? Our temporary site will be comprised of brand new modular units. 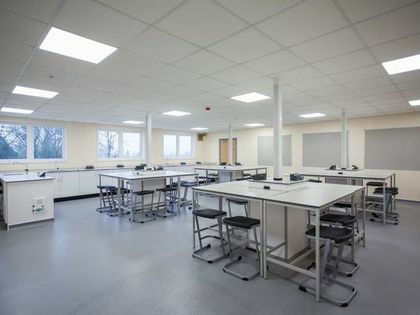 Each area will be fitted ready for use such as a fully equipped science classroom. The below images are examples of similar builds constructed by our contractors. What will the 2020 permanent site look like? Our brand new state of the art building will comprise a wide range of bespoke, fully equipped classrooms and specialist facilities. 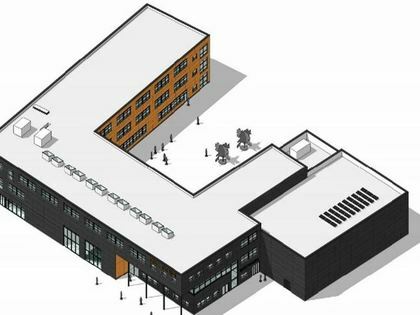 The below image is the current draft drawing of the main building only. In addition to this, there will be a full sized sports hall as well as a number of outside learning and recreational spaces.